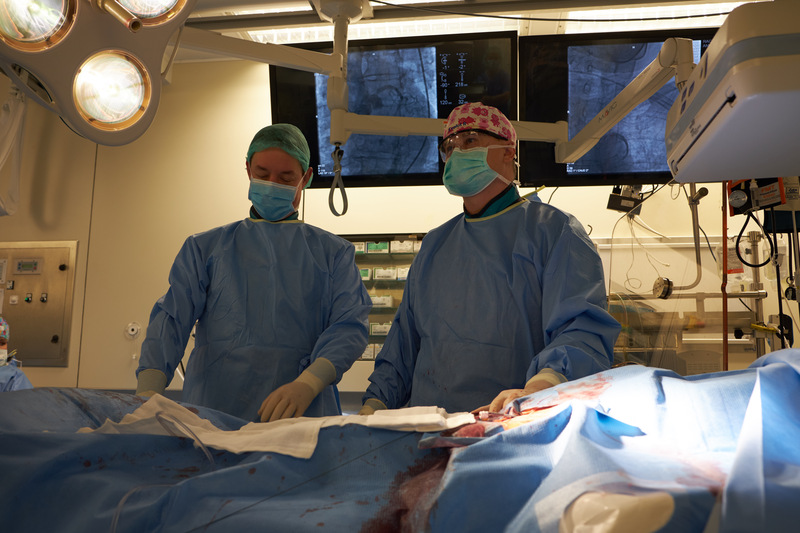 I Cardiology Clinic and I Cardiac Surgery Clinic successfully conducted Medical University of Warsaw’s first transcatheter pulmonary valve implantation (PAVTI - pulmonary artery valve transcatheter implantation). The team of surgeons included Prof. Zenon Huczek, prof. Tomasz Moszura and Radosław Wilimski, M.D., Ph.D. As a result, Medical University of Warsaw joined the distinguished group of centers in Poland that carry out PAVTI on adult patients. The surgery was conducted on a 32-year-old male (with congenital aortic dilatation following Ross procedure at age 12) with symptoms of heart failure NYHA II / III. A 22 mm Melody valve (Medtronic) was successfully implanted percutaneously through the right thigh. The procedure was performed in general anesthesia by Dr. Dorota Komorowska. Echocardiography was performed by dr Piotr Scisło and CT / MRI by Dr. Karol Zbroński. No tricuspid valve regurgitation (TR) was found; only a trace of pressure gradient. The surgery took place on 14 November and the patient was discharged home five days after the procedure. Patients who have undergone the Ross procedure in their childhood often develop infective endocarditis of their pulmonary homograft and require reoperation in adulthood. PAVTI is a preferred treatment because it reduces the risk of reoperation and the return to normal life activities is faster.